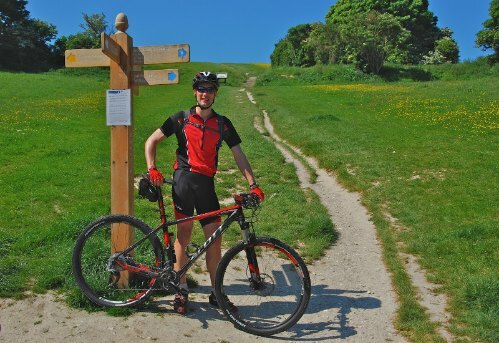 There were 2 major events planned for the June 2012 bank holiday weekend: the Diamond Jubilee celebrations for Queen Elizabeth II and, more importantly, the South Downs Way triple attempt by Richard Sterry. Richard (@hillburner) was planning to complete 3 consecutive lengths of the SDW on his mountainbike. Why? read his blog by clicking on this link. I had little doubt about the answer but I confirmed with Roy and got straight back to Anne - we were in the team. The alarm went off at 5am on the friday morning &, with a bowl of porridge inside, Roy drove me over to meet up with Richard Sterry and Simon Usher. The 3 of us then headed down to Eastborne for the 8 am start. During the drive I was given my instructions and got myself ready. It was a gloriously sunny day as we wound up Richard's elastic band and sent him on his way. Simon and I got the van ready while we waited for a courier to deliver the team T-shirts. They failed to do this so we headed off knowing we needed to make alternate arrangements to get them. The months of planning that had been done had identified suitable 'check point' locations for us to meet up with Richard. Here we could replenish his supplies and also record all of the stats that would allow us to monitor his performance. I was given the responsibility for writing all of this down. achieve his target for the triple of 36 hours. I also had to keep reminding him what the average speed needed to be to hit that target. The last time I had done anything like this was the mid 1980's when Roy and I used to take part in stage rallies. We were both co-drivers/navigators and this would involve getting our drivers or the service crew to the required point at the required time. Things haven't really changed much except for the technology. I still love OS Maps. So we met Richard at Firle, A27, Saddlescombe, Washington, Bury, Cocking, Queen Elizabeth CP, Milbury's and, all too soon, we were in Winchester. Leg 1 complete at 18.14 and time to turn around. Anne had joined us at QECP on the way down and Roy joined us on the way back. Anne had the motor home and Roy, the pocket rocket, our little C1 which he used to zip around and see Richard at additional points. He was responsible for the 99 ice cream at Ditchling Beacon on the final leg. To keep the support team's spirits up, Richard gave us a number of envelopes which were to be opened at set check points. Simon and I spent ages at Saddlescombe trying to make paper planes and this envelope (pictured being opened by Anne) contained torches in readiness for the hours of darkness. The best one was the 'recovery' box full of goodies that we opened when we got to Winchester for the first time. We made Simon and Roy get some sleep during the second leg but unfortunately, we had to get them to 'rescue' us when the battery went flat on the chase van. 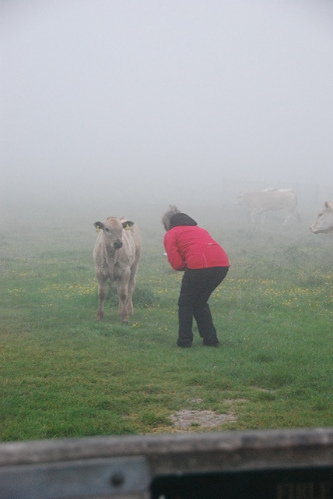 It did mean that we all got to enjoy a close encounter with a herd of cows in the fog on top of Firle Beacon. They were crowding by the gate and we were concerned that they would get in Richard's way. 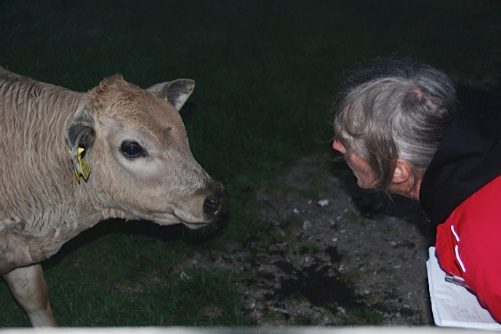 I tried my hand at 'cow whispering' with the calves but only one of them decided to come close to me. Richard reached Eastborne at 06.55 - with a PB time of 22hr 55min for 2 legs. We located our T-shirts (in the grit bin of the local school) and were joined by Dr Jerry. The triple had not been done before and it was not known what effect on the body it would have. At this point I had been awake for 26 hours straight. Simon rode with Richard to Firle beacon while the rest of us went by road - via a petrol station where we got sauage and bacon rolls. Mmmmm! We managed to keep Richard going through the dark times he experienced through the next few check points. He was joined by other riders who were able to encourage him along his way although he didn't like too much chat or crowding. Rachel Sokal and Ant Jordan met us at Steyning - where it looked as though we had reached the end of the attempt. They had been involved in all the planning and were originally going to do some of the roles that Roy and I filled, except Ant was due to ride more with Richard. By the time we reached Steyning, I had been on the go for 31 hours and had mentally prepared myself to see it through to the end. I didn't really want to stop what I was doing. I wanted this to go on to Winchester. But, at Steyning, we were also faced with the fact that Richard might not be able to go on. As he lay on the blanket on the ground, covered with more blankets...step up Dr Jerry and Anne! And he was. 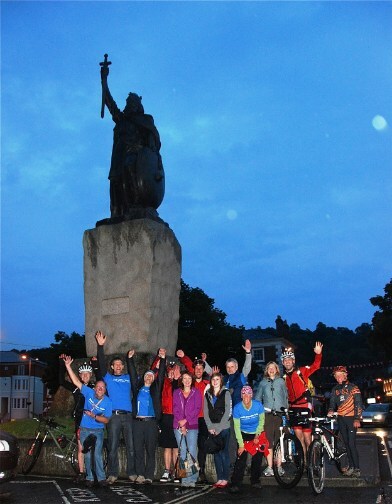 He rode into Winchester at 21.04 - 3 legs completed in 37hrs and 4 minutes. 1st rider to ever do this. A world record! And what did I do? I blubbed like a little baby! I was tired and emotional but I had had a great time. It was incredible to be part of such an amazing achievement. Richard was a total star and what a machine. There are not enough words to describe what he had done. I could only aspire to being able to doing a small part of what he did - but maybe I have picked up a few tips from what I witnessed. Post Script: at the end of the ride, Richard's Garmin showed 34,730 feet of climbing. That's 5,700 feet more climbing than the height of Everest. and in 37hrs 04mins! Puts things into persective doesn't it! And the key to the success - comprehensive planning, a good support team, having a doctor & a physio around, support of friends and strangers and hours of training.